Not for money or thanks, fame or fanfare. Our nation’s LEOs rise each day focused on a mission to serve and protect. With a silent prayer for their safe return, their families see them off knowing that their loved ones were called to a profession and nothing could keep them from their sworn duties. This week we honor all LEOs and remember those who brought to the fight everything they had to give. On that day, at the end of their watch, their commitment and dedication to their communities were not enough. Their training and experience were not enough. So, true to the heart of a warrior, they gave their lives. 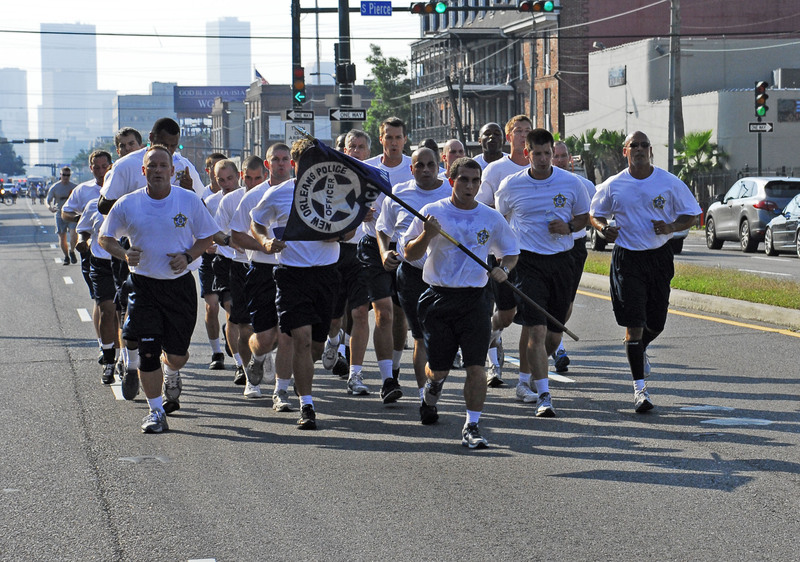 The Fraternal Order of Police, Crescent City Lodge #2, sponsored 29 NOPD Recruits to run in the the 2012 Special Olympics Torch Run in New Orleans, which took place on May 15, 2012. 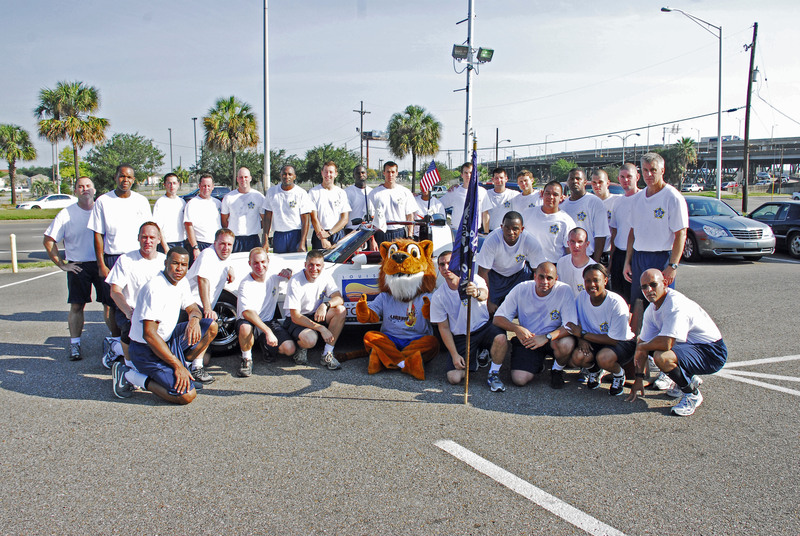 Thanks to the members of NOPD Recruit Class 168 for representing the F.O.P. in this worthwhile event. 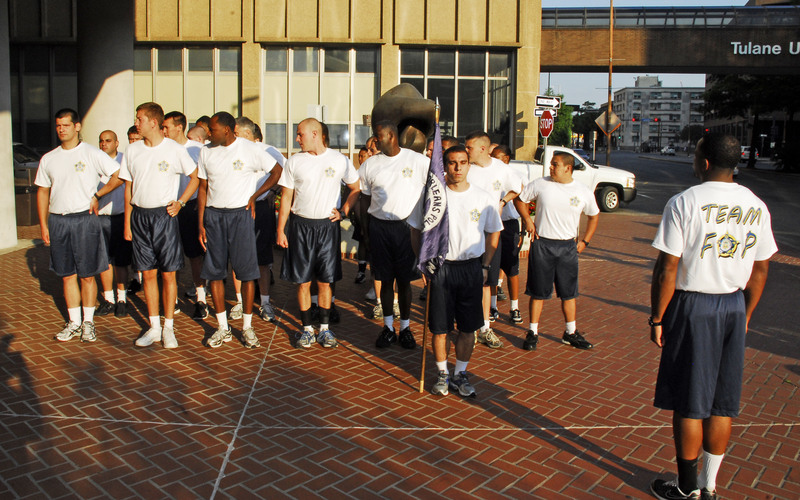 The NOPD Recruits pictured are: Justin Almedia, Matthew Bencik, Shane Bonebrake, Justin Brown, Calvin Day, Robert Fuller, Cole Gordon, Elliot Gray, Michael Guasco, Patrick Guidry, Alton Guillot, Adle Haddad, Robert Hamilton, Daniel Hauck, Brittney Jackson, Terel Jones, Khristopher Kirkland, Sean Lebouef, Alfred Moran, Daniel Oquendo-Johnson, Charles Overstreet, Michael Poluiskis, Nicholas Raziano, Matthew Riffle, Ryne Schuler, Jeremy Simoneaux, Michael Swantek, Kandace Vallory, Randy Walton. THE PRESIDENT: Thank you. (Applause.) Thank you so much. Thank you, Chuck, for that very kind introduction. Chuck is a proud police officer, he’s the proud parent of a police officer, and he has dedicated his life to law enforcement and their families. So I want to thank him for his extraordinary service. I want to recognize the entire Fraternal Order of Police and its leadership, including Jim Pasco, for all your work on behalf of those who wear the badge. I’d like to recognize FOP Auxiliary President Linda Hennie, all the members of the FOP Auxiliary, members of Congress including Speaker Boehner, Congressman Hoyer, and Senator Leahy, as well as members of my administration. And most of all, I want to acknowledge and thank the families of those who have fallen. As Scripture tells us, “Blessed are the peacemakers, for they shall be called sons of God.” Blessed are the peacemakers, for they shall be called sons of God. Our country’s law enforcement officers use force when they have to. They are well armed and they are well trained. But they never forget that theirs is a mission of peace. Their job is to keep the peace, to allow all of us to enjoy peace in our neighborhoods and for our families. And today, with heavy hearts, we honor those who gave their lives in the service of that mission. Their families are in our thoughts and prayers, as we remember the quiet courage of the men and women we have lost. These are officers like Detective John Falcone, of Poughkeepsie, New York. In February, Detective Falcone responded to a shot fired call on Main Street. And when he arrived on the scene, he saw a man holding a gun with one hand, and a small child with the other. In a situation like that, every instinct pushes us towards self-preservation. But when the suspect fled, still holding the child, Detective Falcone didn’t think twice. He took off in pursuit, and tragically, in the struggle that followed, he was shot and killed. He is survived by his parents. But there’s another survivor as well: A three-year old child who might not be alive today had it not been for the sacrifice of a hero who gave his life for another. This willingness to risk everything for a complete stranger is extraordinary. And yet, among our nation’s law enforcement officers, it is also commonplace. Last summer, the North Platte River was running high near Douglas, Wyoming. When a teenage girl got caught in the current, Deputy Bryan Gross, of the Converse County Sheriff’s Office, jumped in after her. The girl was eventually pulled from the water, but Deputy Gross was swept away. And he is survived by his wife, Amy. Today, we remember a man who swore to protect his neighbors, and who kept that promise no matter what the cost. I suspect that at that moment, Deputy Gross wasn’t trying to be a hero; he was just doing his job. You can find that bravery, the courage to do your duty, day in and day out, in so many officers across our country. One of those officers was Deputy Sheriff Suzanne Hopper, from Clark County, Ohio. Deputy Hopper was known as the “go-to person” in her department; no task was too large or too small. And on New Year’s Day, 2011, Deputy Hopper arrived at a crime scene and began a preliminary investigation, just as she had done many times during her 12 years of service. But as she was photographing evidence, a man opened the door of his trailer and fired at her with his shotgun, killing her. And today, we remember not just a fine officer, but a wife, a mother, and a stepmother. We will keep going. There is no pledge that better honors the memory of those we have lost. And there are no memories — there are no words that better capture the unbreakable spirit of those who wear the badge. Because even in the face of tragedy, I know that so many of you will return home and continue to do what you have always done. Some of you will kiss your husbands or wives goodbye each morning, and send them out the door not knowing what might happen that day. Some of you are children and parents, sisters and brothers, whose pride is mixed with worry. And of course, there are the officers themselves. Every American who wears the badge knows the burdens that come with it — the long hours and the stress; the knowledge that just about any moment could be a matter of life or death. You carry these burdens so the rest of us don’t have to. The rest of us can never fully understand what you go through. But please know that we hold you in our hearts — not just today, but always. We are forever in your debt. And it is on behalf of all of us, the entire American people, that I offer my thoughts, my prayers, and my thanks. May God shine a light upon the fallen and comfort the mourning. May he protect the peacemakers who protect us every day. And may he bless, now and forever, the United States of America. **Thanks to Jim Gallagher for sharing this with us. Your agency probably receives public records requests on a daily basis. In New Orleans, members of the media make public records requests every day. They request police reports, recordings of dispatch channels, email records, payroll records, disciplinary records, and whatever other records they think will help them develop a story. Sometimes these public records requests are fishing expeditions by media organizations. For example, there have been “standing” public records requests for disciplinary letters. These records are also frequently sought by criminal justice organizations, criminal defense attorneys, criminal defendants, civil attorneys, and insurance companies. In short, these records are readily available to anyone in the public. Typically, public records requests are made to the custodian of records. The custodian, either personally or through a designee, makes a determination if the public body has the records requested and if they are exempt from disclosure. The law requires that the requestor be notified of this determination within three days. In New Orleans, the requests are analyzed, the documents are collected, and then the request is reviewed by the Law Department for compliance with public records laws. Any information which is exempted is not disclosed. They also attempt to redact any confidential information which might be included in otherwise public records. Once the custodian and the Law Department put their stamp of approval on the request, the documents are released for inspection, copying, etc. All NOPD dispatch channels are recorded. They are recorded even if the dispatch channel is not being used as a dispatch channel. For example, Disp 5 is often used as a talk channel instead of a dispatch channel. It is recorded all of the time. Those recordings are public records and subject to disclosure. There are talk channels which are not recorded. Nobody wants to create a public record about their need to remain in the bathroom for an extended period of time because things aren’t working out as planned. When you send messages by MDT, those messages are always recorded. Those messages are public records and are subject to disclosure. We saw a dramatic example of how these records can come into play in the investigations that followed the Rodney King incident in Los Angeles. Departmental emails are kept on city servers, even if they are deleted on a computer. YOU SHOULD NOT USE YOUR CITY EMAIL ADDRESS FOR ANYTHING OTHER THAN CITY BUSINESS. These documents are public records. If you use your department BlackBerry to keep your calendar, all of that information is public record also. If you are issued a department BlackBerry (or other phone), all text messages, phone call logs, notes, etc. on that device are public records. They are subject to disclosure much like any other public record. There have been cases where law enforcement officers have been ordered to turn over text messages and phone call logs from their personal phones as part of disciplinary investigations. These orders have been upheld in certain instances where the request can be clearly shown to be job related and the request is narrowly related to the job. Once these records are turned over, they become a public record. If you refuse the order, it could be insubordination. You should always be aware that it is difficult to accurately place the context or tone of typewritten messages. It is often hard to tell if someone is joking or being sarcastic in a text message or email when it might otherwise be clearly evident in a face-to-face discussion. When a typewritten message becomes a public record, the context of the discussion is not necessarily taken with it. In short, be careful of what you say (type). These messages (discussed above) are likely to become public record and can be misconstrued if they rely heavily on context to influence its meaning. It pays to pay attention to public records. Carelessness can result in embarrassing disclosure of private information, disciplinary action, or criminal liability. The Louisiana Public Records Law insures that public records are available for inspection by the public. This has an impact on law enforcement in a number of ways. Therefore, it is important for law enforcement personnel to be familiar with the Louisiana Public Records Law. For the purpose of law enforcement personnel, your agency is a public body within the definition. A public record is anything maintained by a public body which is not exempted from disclosure by another law. The “custodian” of these records is the head of the public body having custody and control of these records. For the New Orleans Police Department, the Superintendent of Police is the custodian of records. For the Kenner Police Department, it is the Chief of Police, and for the Jefferson Parish Sheriff’s Office, it is the Sheriff. These custodians often appoint someone to act in there capacity as custodian. In New Orleans, this is normally a function of the Records and Identification Division. Certain law enforcement records are exempt from disclosure. Records pertaining to “pending criminal litigation” are exempt from disclosure. Records pertaining to confidential informants or which contain information that could identify the source of confidential information are exempt from disclosure. Records containing security procedures, investigative training information or aids, investigative techniques, investigative technical equipment or instructions in the use thereof, criminal intelligence information pertaining to terrorist-related activity, or threat or vulnerability assessments collected or obtained in the prevention of terrorist-related activity, including but not limited to physical security information, proprietary information, operational plans, and the analysis of such information, or internal security information are exempt from disclosure. Records of the arrest of a person until a conviction or acceptance of a plea of guilty by a court of competent jurisdiction are exempt from disclosure. EXCEPT that ALL initial incident reports are ALWAYS public record. Information which would reveal undercover or intelligence operations are exempt from disclosure. The identity of the victim of a sexual offense is exempt from disclosure. Records containing the identity of an undercover police officer or records which would identify an undercover police officer are exempt from disclosure. Records concerning juvenile status offenders are exempt from disclosure. In addition, LSA 40:2532 forbids disclosure of a law enforcement officer’s home address, photograph, or other confidential information (SSN, DOB, etc.). 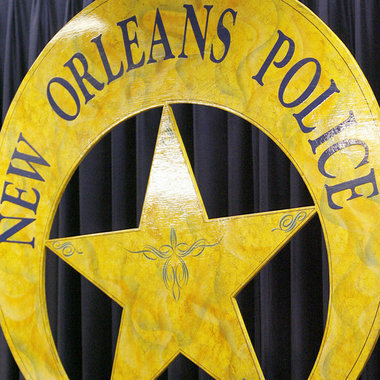 NOPD Police Officer Jason Lewis was formerly a NOPD K-9 handler. In 2009, Officer Lewis suffered the loss of his K-9 partner, Primo. Following the loss of Primo, Officer Lewis was investigated by the Public Integrity Bureau. The Public Integrity Bureau did not find Officer Lewis responsible for Primo’s death. Despite a “no true bill” from an Orleans Parish Grand Jury, the District Attorney’s Office filed a Bill of Information and charged Officer Lewis with a felony. At some point, Officer Lewis and his attorneys decided that it was in his best interest to plead guilty to a misdemeanor to avoid what they perceived as a hostile trial environment. Officer Lewis was subsequently terminated from the New Orleans Police Department by Superintendent Ronal Serpas. Officer Lewis appealed to the Civil Service Commission who upheld the termination. FOP Attorney Ted Alpaugh appealed the Civil Service Commission’s decision to the 4th Circuit Court of Appeals for the State of Louisiana. On appeal, the 4th Circuit Court of Appeal reversed the decision of the Civil Service Commission and ordered Officer Lewis reinstated to his employment with back pay and emoluments. That decision can and should be read here. Congratulations to Officer Lewis and Mr. Alpaugh on a well-deserved victory.